Gareth Maybin can become just the second Irishman to win the Sir Henry Cotton "Rookie of the Year" Award. The Ulsterman, 28, jumped to 46th in the Race to Dubai rankings despite blowing his chance to win the Moravia Silesia Open in the Czech Republic on Sunday. Tied for the lead with eventual winner Oskar Henningsson five to play, Maybin dropped four shots coming home but vowed to come back stronger in the KLM Dutch Open in two weeks. After jumping 12 places to 115th in the world, the Challenge Tour graduate insisted he would draw confidence from his fifth top-10 of the season. And with earnings of €428,023, he’s on track to chase down Open hero Chris Wood in the race for Rookie of the Year honours. Peter Lawrie became the first Irishman to grab that honour in 2003 but Maybin is just a maiden win away from becoming a serious contender to follow in his footsteps. But Irish players have been disappointed in the past with Graeme McDowell edged out by Paul Casey in 2002. Casey won more money that year - he played more tournaments - but McDowell won a tournament in just his fourth start on the main tour and still came up empty handed. English ace Wood, 58th in the world now after finishing tied third at Turnberry, is the leading rookie at 32nd in the money list with shock Wales Open winner Jeppe Huldahl of Denmark ranked 40th and Swede Henningsson 42nd. Rory McIlroy is still Ireland’s top player in the Race to Dubai where the top 60 will contest the $10m Dubai World Championship in November. McIlroy is fifth behind pace setter Paul Casey with a cool €1.34 million with Graeme McDowell 41st, Peter Lawrie 54th and Damien McGrane just inside the qualifying places at 60th. Michael Hoey (73rd) and triple major winner Padraig Harrington (84th) still have work to do to make sure of their places in the season-ending mega tournament. But Kilkenny’s Gary Murphy is now in real danger of losing his card after his 12th missed cut of the season left him over €60,000 outside the vital top-115 in 154th. Darren Clarke and Paul McGinley are exempt on tour thanks to their career earnings but at 107th and 127th in the money list, they need big results to earn their places in Dubai. Gareth Maybin has set his sights on Rookie of the Year honours after grabbing a last gasp invite for the Dubai Desert Classic. Gareth Maybin has earned some serious wedge this season - €373,023 to be exact. Maybin. Maybe?If he keeps playing the way he played in the Moravia Silesia Open on Friday, he’s a shoe in to make the top 60 money winners who will play the inaugural Dubai World Championship in November. Ranked 52nd in the money list, he’s also an outside good bet to give Open hero Chris Wood (31st in the 'Race' and 19th in the Czech Republic so far) a run for his money in the Rookie of the Year stakes. No Harrington. No McIlroy. No Clarke. No McGinley. No Lowry. No McDowell. No matter. 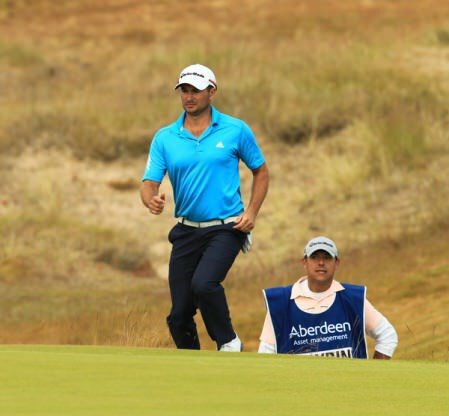 Gareth MaybinGareth Maybin proved that he is becoming a player to watch closely when he finished tied for 12th behind the likeable Argentinian Ricardo Gonzalez in the SAS Masters at Barsebäck near Malmö. Now nicknamed The Axe Man after spending last month back home felling trees on his farm, big-hitter Gonzalez birdied five of his last six holes to win by two shots from the Welshman Jamie Donaldson on 10 under with Maybin the top Irishman. Gareth Maybin had to settle for second best behind Chris Wood in the Sir Henry Cotton Rookie of the Year stakes. Wood, who turns 22 on Thursday, was the highest ranked newcomer in the Race to Dubai standings, finishing in 44th place with earnings of €679,559. Gareth MAYBIN (NIR) during the third round of the 2013 Aberdeen Asset Management Scottish Open played over Castle Stuart Golf Links, Inverness, Scotland from 11th to 14th July 2013: Picture Stuart Adams www.golftourimages.com: 13th July 2013Take a look at Gareth Maybin’s season and it looks like he’s struggling. Ranked 109th in the Race to Dubai and 414th in the world, the 32-year old Ballyclare man is still seeking his first win on the European Tour since he earned his card through the Challenge Tour rankings at the end of 2008.